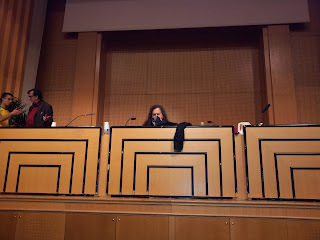 This Wednesday at Sciences Po in Paris, I had the opportunity to hear Richard Stallman, the founder of the Free Software Foundation, give a talk on the threats to our freedom in a digital world. The content of his presentation can be found on the Gnu webiste. The purpose of this article is to highlight the points which resonated the most with me, and to give my take on a few of the issues on which I disagree with Stallman. 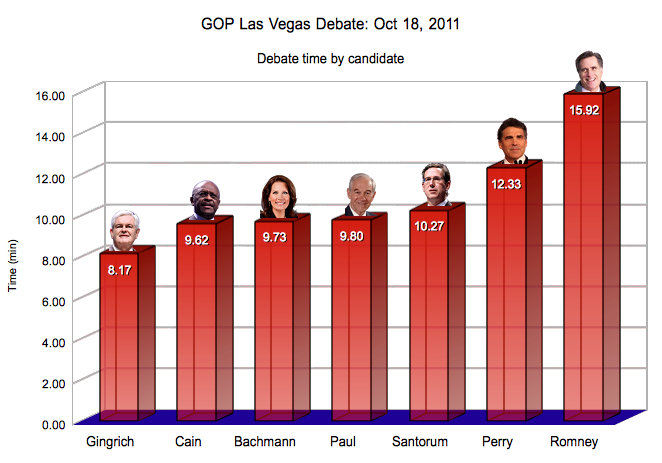 So many interesting points were raised, making it difficult to keep this article short. Following is a list of quotes from the presentation which struck a chord with me. Hopefully they will entice the reader enough to continue this article or research Stallman further. On censorship: "A country that imposes censorship on the internet is not a free country, and is not a legitimate government either." On proprietary software: "Proprietary software is an injustice and should not exist, because it leaves the users without freedom." On proprietary software in education: "A proprietary program is the enemy of the spirit of education: it's knowledge witheld." On internet services controlling your data: "In an epoch where governments work for the megacorporations instead of reporting to their citizens, every technological change can be taken advantage of to reduce our freedom." On open source software: Open source is "a term coined by people like Torvalds who prefer that these ethical issues don't get raised. If you agree with them, say open source, if you agree with us, say free software." On the war on sharing: "In the war on sharing, they are prepared to abolish the basic principles of justice. These are not legitimate governments. They are paid to defeat the people no matter what it takes." Over the last year, I have developed an interest in freedom and liberty in our lives in general, but my research and thinking has not focused much on freedom of software. As a developer for companies making proprietary products, I have not been a great fan of the GPL license for software, created by Stallman, which states (in section 2b of GPL v2) that including, even without modifying, a GPL-licensed software in a product requires the source code of the entire product to be made public. I have viewed this not as freedom, but as a sometimes unrealistic restriction to developing and selling software. 4) find and purchase a commercial library which can open the HTTP connection, if such a library exists. If this is the approach taken, then we can see that using a GPL license may actually encourage the use of proprietary software. This is one of the reasons for the creation of the LGPL ("Lesser" GPL) license. 5) GPL your software. Hopefully you are rich enough to work for months without compensation, since once the source code is released, there will be little incentive for customers to pay for software they can obtain freely. Perhaps you can have a "pro" version which includes technical support. Given my feelings about the GPL, I was surprised to find myself being convinced by many (but not all) of Stallman's arguments. His talk not only covered the issues of proprietary software which the GPL tries to address, but also the use of technology by governments to restrict and control the people, sometimes in the interests of the megacorporations, sometimes simply to control the people as a dictator would. Before he began speaking, the host explained that Stallman needed a minute to clean his feet. Also of notice was the 1.5L bottle of soda he had next to him, in contrast to the 50cl bottles of water often seen with presenters at conferences. 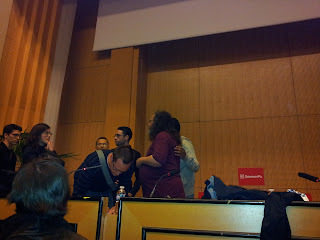 Stallman initially began presenting in French. While he was able to express himself well enough in French, the organizer requested that the conference be done in English. He opened the presentation by stating that technology is not inherently good or evil. The way technology is used, however, by individuals or authorities, can allow us to have more or less freedom. The talk then focused on threats we face by living in a digital society. Many of the examples he cited were specific to Europe, which makes sense given that the talk was in Paris. Stallman cited several examples of surveillance in recent years. In some cases, some level of choice is involved, when you purchase products which allow a company to remotely monitor your activity. Stallman mentioned the Amazon Kindle (which he baptized the "Amazon swindle") as an example, as Amazon can not only track which books you've purchased, but can also remotely remove books from your Kindle at will, as they did in 2009, ironically, with the book 1984. Owning and using a cell phone are increasingly becoming viewed as a necessity, although Stallman himself apparently does not own one. Cell phone operators may store months of your location data, even with the GPS disabled, as your approximate location can be determined by triangulation of the cell towers near you. Stallman cited a case in which German MP Malte Spitz sued Deutsche Telekom to obtain information the company had on his location, discovering that the telecom company had tracked and stored over 35000 location points over six months. While it may still be possible to retreat from a digital society by choosing to not own a mobile phone, surveillance technology still impacts us the moment we choose to step outside. In a world without digital surveillance, we do assume a loss of privacy when we are in a public area. Somebody who saw you at a certain time and place can always report your activity to authorities. However, the employment of digital surveillance technology can exponentially facilitate the authorities' ability to track your activities, as they are indexed in a database and made searchable. Stallman mentioned in particular surveillance in the UK, stating that all car travel is monitored with cameras on the side of the road, and that this has been used to stop protesters on their way to participate in a protest. Stallman did not mention some uses of digital technology employed currently in the United States for surveillance, not just at airports, but also in the streets, some of which is being rolled out in some European countries: the use of x-ray or millimeter wave machines which produce a digital image of a traveler's naked body at an airport, or in the case of backscatter vans, allow to see inside vehicules or scan pedestrians. The second digital threat which Stallman mentioned is internet censorship. In addition to countries like China, where censorship might be expected, internet censorship is also seen in the UK, France, Spain, Italy, Denmark, and Australia. Denmark filters websites which are on a secret black list. 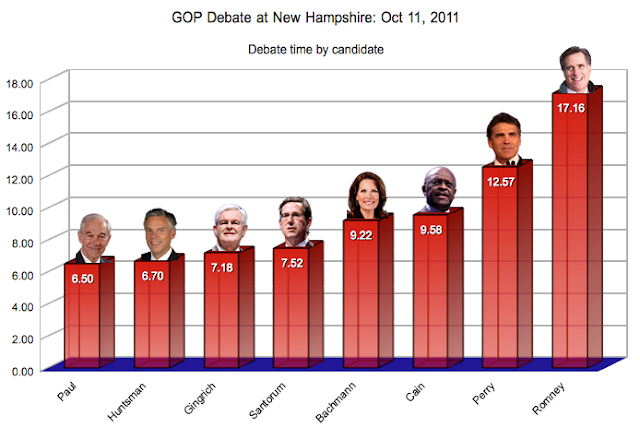 This list was leaked by Wikileaks. At this point, Stallman incorrectly (as far as my research shows) claimed that Denmark reacted by placing the Wikileaks leak of the black list on the black list itself, thus enabling the whole world, except Danes, to know which sites Danes could not see. However, and as Stallman's own written presentation describes, it was in fact Australia which placed the Danish blacklist on their own list of forbidden sites. Australia's censorship does not involve filtering, but heavy fines ($11000/day) for Australian web sites which link to websites on the black list. Stallman did not mention the censorship practices in the United States, where DHS/ICE have seized blocks of domain names whose sites are accused of copyright infringement, on at least one occasion also taking down thousands of unrelated sites in the operation. Stallman explained that a program which stores your data in a proprietary format which cannot be read by other programs restricts your freedom to do what you want to do with your data. He described this as "digital handcuffs". He further declared that it should be illegal for companies to use secret data formats. This is one example where I diverge from Stallman's viewpoints. For data such as word processing documents, spreadsheets, presentations, GPS tracks, music, images, and probably many other types of data, a myriad of open formats exist today, without government coercion. I don't believe it is necessary to put people in prison for developing proprietary data formats, as multiple alternatives are already freely available. I would agree that any data provided by taxpayer-funded services should be in an open format, providing full transparency and allowing people to control and completely view and share public data. One violation of this principle which Stallman cited is the Italian government's public television station RAI which distributes content in a proprietary format, VC-1. This is the heart of the GNU GPL, whose goal is to promote free software. This is discussed in detail in the written presentation. When talking about free software, Stallman emphasized that the word "free" is used to indicate the freedoms the users have to use, study, modify, and share the software. The word "free" has nothing to do with price. A program may be developed or sold for a fee, and still respect the principles of "free" software, if the source code of the software is available and no restrictions are made upon the usage of the software. Stallman also pointed out a difference between "open source" and "free" software. "Open source" essentially means that the source code to a program is made available, while a "free" software license not only makes the source code available, but also allows the users to use, study, modify, and share the software as they wish (as long as the resulting software is also "free"). 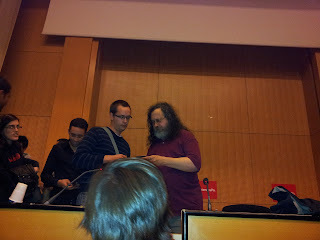 Stallman discussed the use of proprietary software in educational institutions, from primary school to university. According to Stallman, schools should only use and teach free software. Corporations donate proprietary software to schools, and as a result, the students develop a dependance on the proprietary software. Once the students graduate, they must either purchase the proprietary software, or work at a company which purchases the software. Stallman likened this dependance to giving heroin to children in schools. As far as using both proprietary and free software in schools in an effort to provide a balanced education, he compared this to providing students which lunches which include both spinach and tobacco. People willingly and knowingly give some data to certain websites, such as Facebook. Even if Facebook provides some privacy controls over this data, these privacy controls can change without notice, and Facebook has the ultimate control over your data. "Software as a service" is the computing of your data by another machine over which you have no control. One example Stallman cited is voice recognition software, where the voice processing is done on a remote server. The owners of this server have access to all the voice content you produce. The owners of the machine may not even have control over your data, however, if they are not using free software, but proprietary software developed by yet another party. Since the enactment of the PATRIOT act (which, I agree with Stallman, has a hypocritical name), police can access any individual's data maintained by a company, without a court order. He warned the audience to not trust any of their data with a United States corporation or foreign subsidiary. Stallman's position on this topic: The only way to control your own data is to do your own computing on it with free software. Unlike for proprietary data formats, he did not seem to advocate making software as a service illegal. 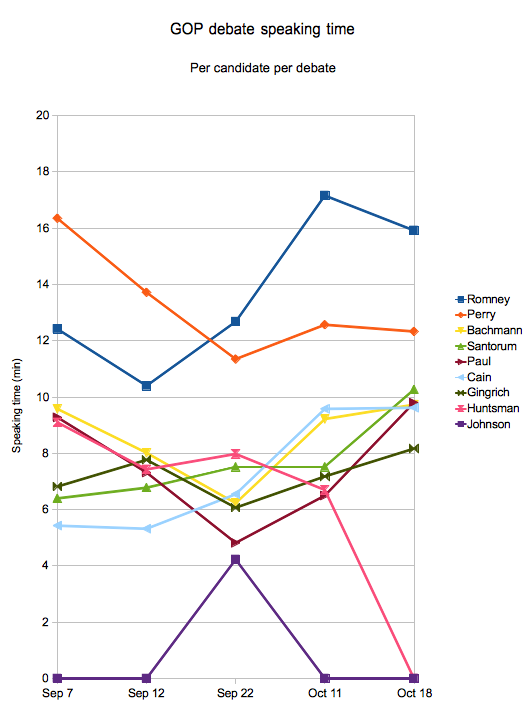 Stallman has little confidence in electronic voting systems, even using free software. Even if the source code of the software is public and has been validated, the software would need to be evaluated in real time during the voting, to ensure that a modified version of the software was not deployed during the election. According to Stallman, "one of the most tremendous benefits of digital technology is that it is easy to copy works and share them." The megacorporations have been employing draconian measures to fight this. These measures range from suing teenagers for hundreds of thousands of dollars, to DRM ("digital handcuffs") to buying a law from congress which made it illegal to use a software to decrypt a DVD, to laws like HADOPI in France. 1) A tax. A certain amount of money from public funds could be used to compensate artists according to their popularity. a) with governments in the US and Europe getting further and further into debt, do we really need a new tax (however small), especially one which doesn't serve the people? If this tax would replace any government resources currently used in enforcing other measures the megacorporations have already bought (HADOPI or similar laws, court trials for file sharers, etc), and result in saving money and fewer infringements on privacy, then I might support it, only on a "lesser of the evils" principle. b) France (maybe other countries) already has a tax on hard disks, CDs, etc, expressly to compensate for file sharing. However, this has obviously not been enough to appease the record companies, as HADOPI was enacted, and politicians are still proposing new additional taxes to compensate artists. The United States already has a tax on blank CDs marked for music use. c) Who would decide what artists could benefit from this task, and what criteria would be used? I have made some music videos with entirely original content on YouTube. What would I have to do to get a part of the money raised by this tax? 2) A voluntary system in which people could donate to artists, in exchange for being free to share their music. 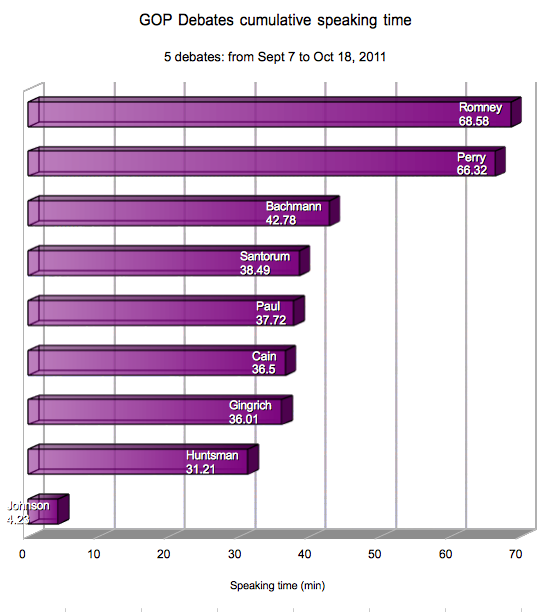 Stallman proposed donations as low as one dollar. It would be interesting to see how this could work out. By looking at the Apple App Store and Google Market, while they deal with mobile apps and not donations to artists, we can have an idea of how willing people are able to pay a low price of one dollar for a product. If there are activities we can do freely in the physical world, we should be just as free to do them in the virtual world. In the physical world, you can stand on the street and ask people to put money in a can. In the virtual world, you need the approval of companies (payment processing companies, banks) to receive donations. In the physical world, you can print out copies of flyers to distribute and promote your views, to people on the street. In the virtual world, if you wish to promote your views, you depend on domain name registrar to have a website, or use a site like blogger.com as a service. In the real world, if you rent a building and use it to promote your views, you cannot be shut down or evicted for the content of your views (this is not necessarily true in countries like France which prohibit hate speech), but only if you fail to pay your rent. In the virtual world, Wikileaks was shut down by a "DDOS" attack from the United States government, requesting or demanding that companies like Amazon, Paypal, Visa and Mastercard cut off service to Wikileaks. At the end of the presentation, Stallman auctioned off a plush gnu, the money to be donated to the Free Software Foundation. He pointed out that this would be an excellent companion to a plush penguin which many of us might have (I do have one), to have the complete pair of mascots for GNU/Linux. I placed a few bids on the plush, but quit after 80 euros. 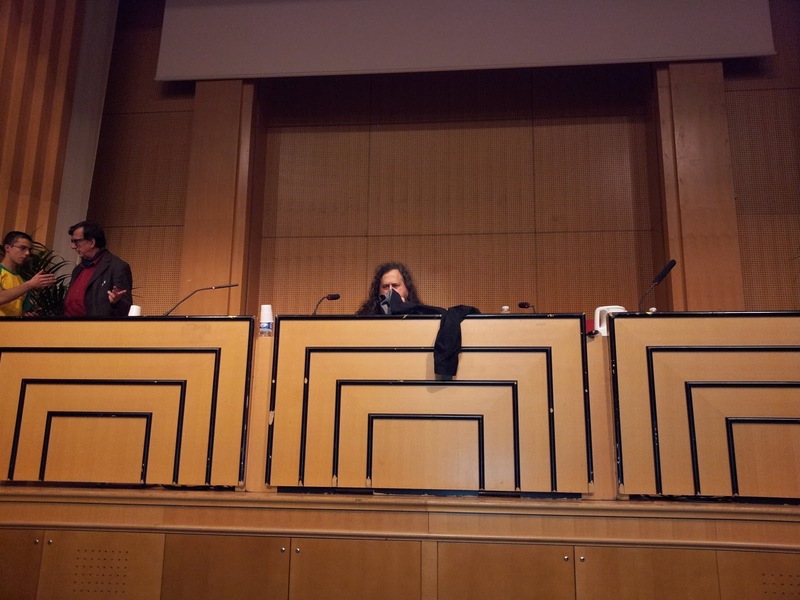 After each pause in bidding when it seemed that the auction would be over, Stallman encouraged more bids by cuddling the plush and asking the audience "Do I hear X euros for an adorable, soft gnu who needs a home? For the promotion of free software?" The gnu was finally sold for 420 euros. While I may not agree with Stallman on all the viewpoints he presented, he makes a strong case, with relevant examples and reasoning, that we need to work to protect our rights and freedoms in the digital world. His humor and eccentricity are a bonus, and I would recommend hearing him speak if you have the opportunity.